Our Brazil project is located in the state of Sao Paulo in the 60 million-year-old Atlantic Forest. The forest spans across the eastern coastline of Brazil, Argentina, and Paraguay and is one of the world’s top five biodiversity hotspots, despite losing 85% of its original vegetation. The remaining forest is in far greater danger of disappearing than the more renowned Amazon Rainforest. We are actively working to restore networks between patches of forest with high biological importance. Contiguous forest networks are essential for the conservation of endangered species like the primate black lion tamarin and the giant anteater. The long-term goal of this project is to connect the Morro do Diablo State Park to the Iguaçu National Park, two core areas of the Upper Paraná Atlantic Rainforest Biodiversity Vision. This forest is home to 20,000 species of plants and thousands more of birds, land mammals, reptiles and amphibians. Planting trees combats the progressive loss of biodiversity. Over 11,000 species of plants and animals are listed as threatened or endangered. The trees planted in Brazil play a significant role in building up the carbon sink. This project aims to sequester up to 317 tons of CO2 per hectare. Trees can reduce future carbon emissions and actively remove the excess carbon from our atmosphere. We are working with the local communities to involve them in conservation projects and capacity building. The project offers training and income opportunities in agroforestry, organic farming, and seedling production. Many of the participants are women. We also build awareness of why restoring forests is a valuable effort. 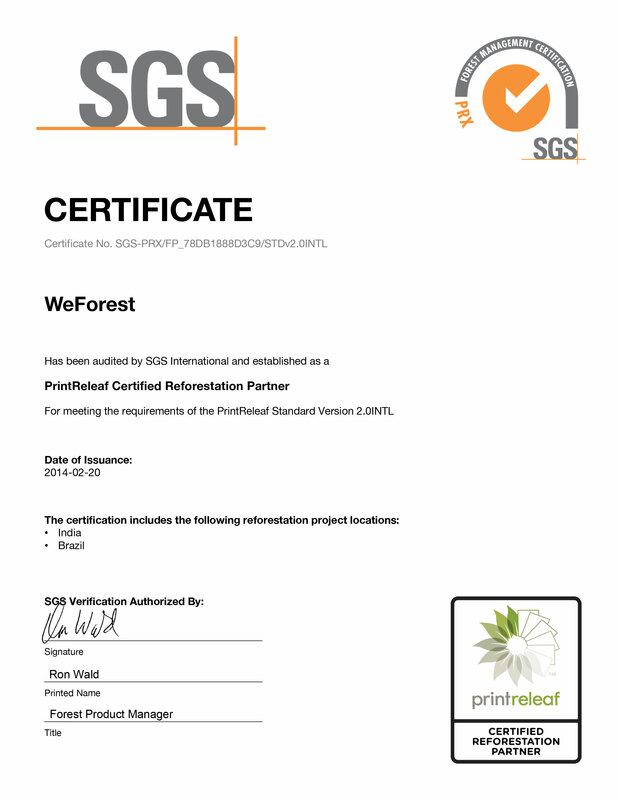 Our reforestation partner in Brazil is WeForest, an international non-profit that specializes in mobilizing companies to restore the World’s forests and embark their stakeholders into a long-term journey towards environmental sustainability.